The homeowners, who'd lived on the island for more than three decades, transformed the property into their dream house. There’s a beautiful balance of old and new in every room. 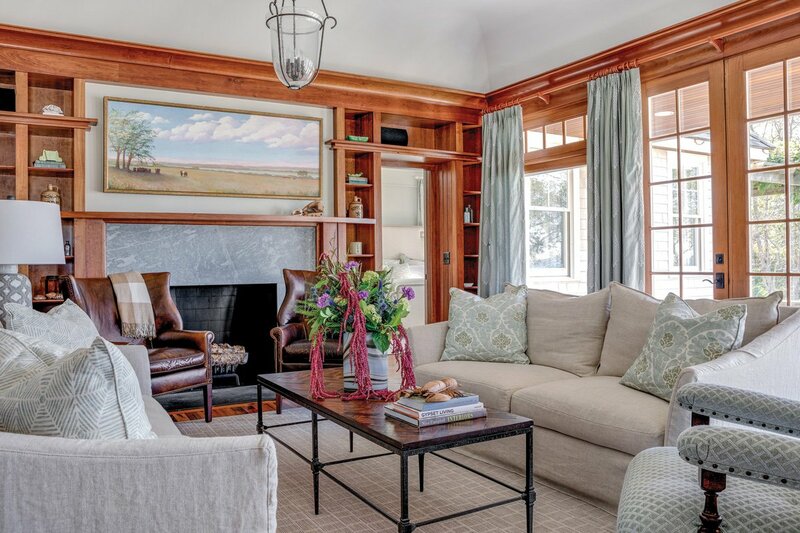 In the living room, leather chairs and cherry millwork are softened by linen sofas and chairs by Lee Industries. 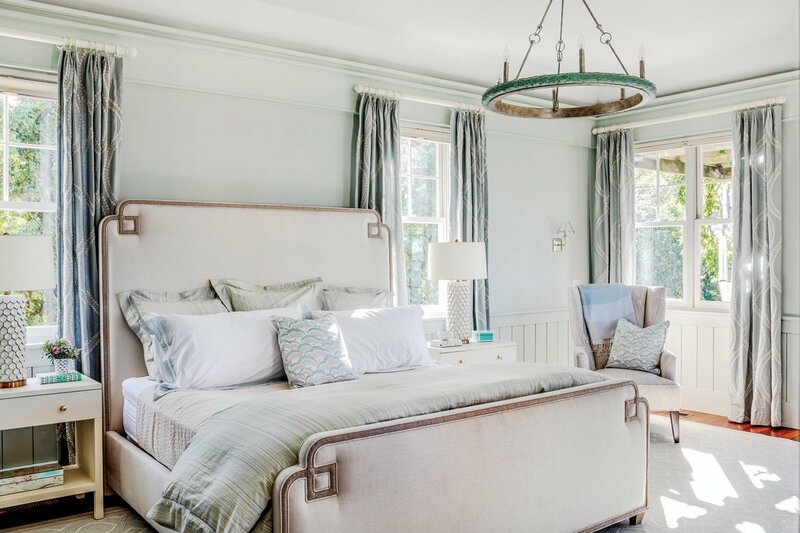 Anna French draperies and Travers pillows add touches of coastal color. Photography by Greg Premru. Sometimes, home renovation projects start small and stay that way. Other times, plans change. In the fall of 2017, a local couple fell for this Craftsman-style home in Jamestown. The pair had lived on the island for thirty-six years and had raised three children there. While downsizing may have been their original intent, this place spoke to the empty nesters. It had the potential to be their dream home, where they could host their grown children and grandchildren throughout their golden years. Dreamy as it was, tweaking was required to make it their own. To begin, the couple commissioned Jocelyn Chiappone of Digs Design Company to renovate their living room and master bedroom. Chiappone guesses the house — with gorgeous cherry millwork — hadn’t been touched in twenty years. 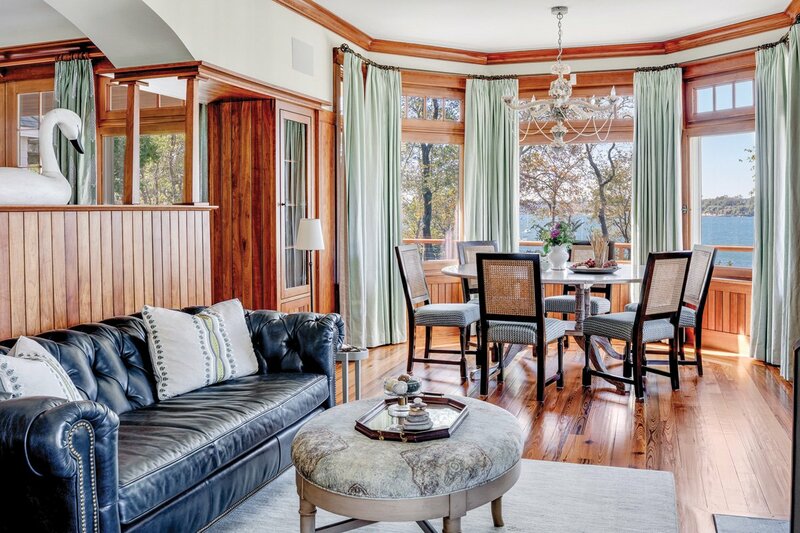 “It really needed some TLC, but it had good bones and gave you a wonderful feeling,” says Chiappone, adding that although the property sits on the Jamestown waterfront, it has all the charm of an Arts and Crafts-style lake house. Chiappone’s consultation with the homeowner went well. In fact, it went so well the project morphed almost immediately from two rooms to a comprehensive interior overhaul. Chiappone partnered with Downes Building Company in Middletown for the work, which took a year from start to finish. In the kitchen, new tile, fixtures and a hammered nickel apron sink were installed, but the original cabinetry was preserved. Photography by Greg Premru. 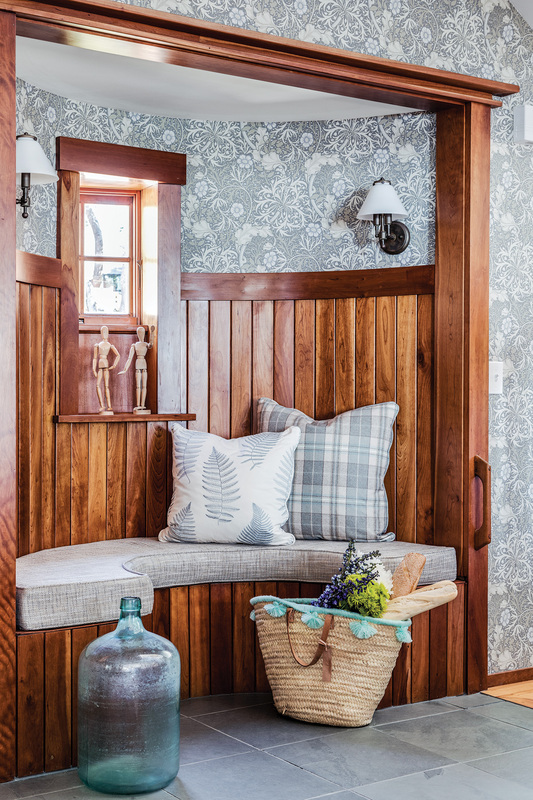 While the homeowners wanted a coastal vibe, they didn’t want kitschy (no anchors, please). Their affinity for antiques and penchant for classic styling is what drew them to this home in the first place, so even if updating was warranted, preserving the home’s integrity was essential. Prior to meeting with Chiappone, the homeowners had planned to paint the cherry millwork white, but Chiappone advised against it. Instead, the warm wood was refinished in a satin treatment and Chiappone introduced coastal flavor through fabrics and paint choices, including the recurring blue/green accent color, celadon. “The woodwork is really a dominant player in terms of the space, so I needed to find a color that would be suitable and play off that cherry,” Chiappone says. The dining table is Somerset Bay; the dining chairs accent both the woodwork in the room and the navy sofa. Photography by Greg Premru. The dining area’s masculine bones presented a unique opportunity to create an intriguing juxtaposition by introducing soft accents: Celadon draperies and a delicate shell chandelier by Made Goods add whimsy, while old heart pine floors and a navy leather sofa with nailhead detailing add richness. “All good design is about contrast,” says Chiappone. 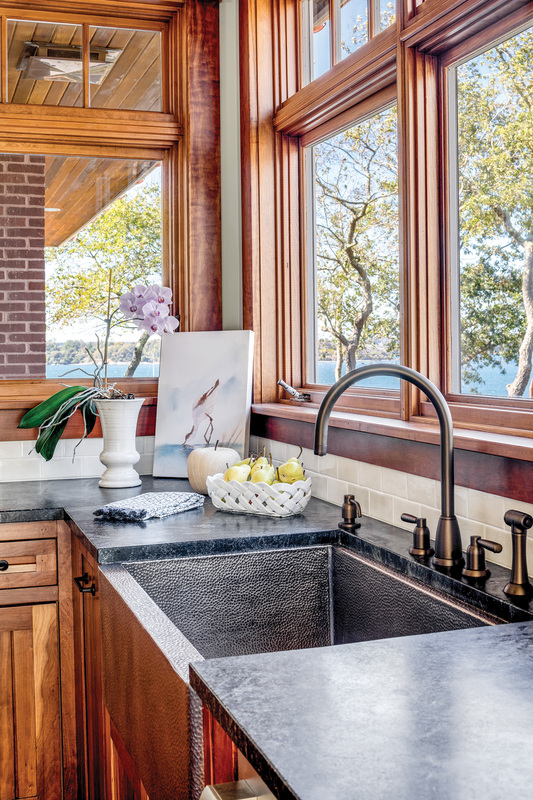 For the master bath redesign, the homeowners imagined something “a little bit more feminine, a little bit more fun,” says Chiappone — a stark contrast to the existing design that looked straight out of the 1950s. The glass undermount sinks in light aqua, by Kohler, were an early choice. “Those really dictated the rest of the design,” Chiappone says. 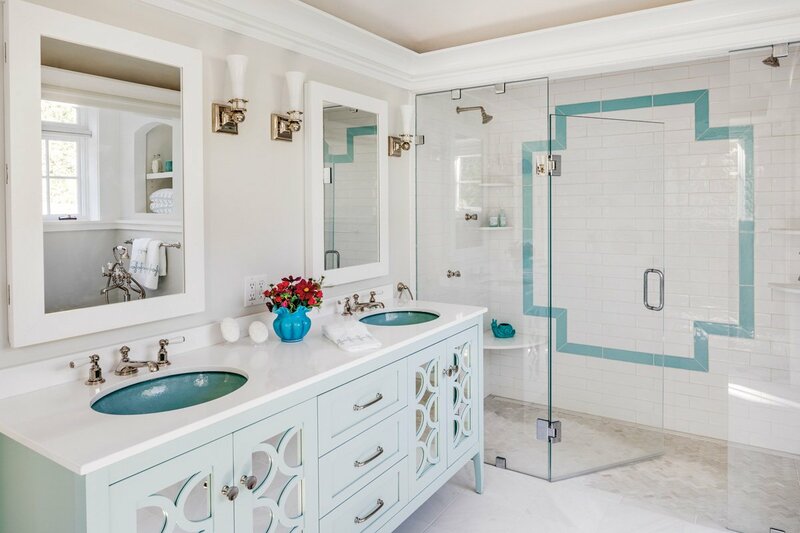 The shower was enlarged, with dual shower heads, body sprays and aqua accent tile to play off the pop of color in the double vanity. Photography by Greg Premru. In the master bedroom, the goal was to create a serene, unfussy “happy place” where the couple could unwind and relax. “The paint really masked the defects of the millwork,” says Chiappone. An elegant seaglass chandelier by Currey adds an extra touch of class. The piece is unexpected and one the homeowners love, Chiappone says. The centerpiece of the room is a luxuriously upholstered bed frame, and Pine Cone Hill bedding completes the sumptuous experience. On the upstairs landing, Chiappone accentuated notes of blue in this William Morris printed wallpaper by painting the curved ceiling above the desk in a similar shade. 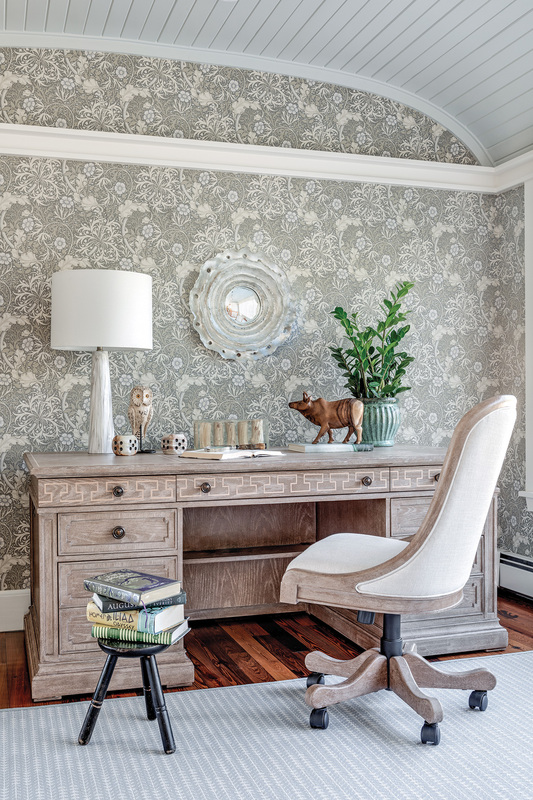 The desk, by Stanley, is reminiscent of driftwood, making it an ideal accent piece for the home. The mirror is by Carvers’ Guild. Photography by Greg Premru. The master bedroom’s palette inspired color choices elsewhere. Celadon is the dominant color here and it’s carried through the rest of the house in drapes, pillows and wallpaper, complemented by whispers of blue and white.